Chivas Brothers has extended The Glenlivet Nàdurra range with a peat-influenced Scotch whisky inspired by production methods used by the distillery’s founder, George Smith. The Glenlivet Nàdurra Peated Whisky Cask Finish is the first in the range to have a “subtle, smoky taste profile”, a result of its final maturation in American oak casks that have previously held heavily peated Scotch whisky. 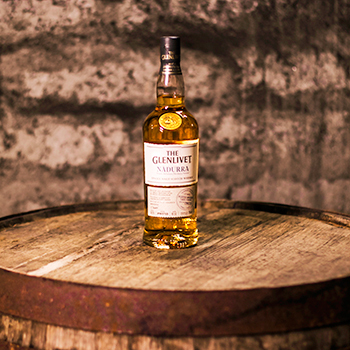 Bottled at a cask strength of 61.5% abv, the whisky is inspired by the early production processes at The Glenlivet Distillery in the 1800s when peat smoke to dry the malted barley. “I’m delighted to present the purest expression of The Glenlivet, which pays homage to the distillery’s legendary past,” said Alan Winchester, master distiller at The Glenlivet. “Nàdurra captures the original passion behind George Smith’s distillery, which inspires us to create new flavour journeys for consumers so his spirit remains alive today. The whisky follows the launch of The Glenlivet Nàdurra Oloroso and The Glenlivet Nàdurra First Fill Selection in 2014. Chivas Brothers said it hoped to build on the “cult success” of the original no-age-statement Nàdurra whisky by expanding the bottling into an entire range. The Glenlivet Nàdurra Peated Whisky Cask Finish will be available in nine domestic markets and global travel retail from this month at an RRP of US$89.99. More likely this was inspired by the 2004 Glenfiddich Caoran Reserve, the description of the product is virtually identical. It’s also highly unlikely that the founder would have been using a Bourbon cask, but why let facts get in the way of a good marketing department yarn.